Contemporary or classic, truly vertical or slant, wood or metal, 2-ply laminate or marble: the choices are endless. You probably have an idea of what you want: let us know and we'll be able to make YOUR desk look great! Item #261C - 2" x 10"
This is truly a stunning deskplate and yet well within anyone's budget. A terrific gift for boss, employee or co-worker - or even yourself! Make a statement with understated elegance. Truly a masterpiece. Our MOST popular deskplate for the past several years! Item #46B - Black Marble, without card holder with brass plate with gold border. Includes one line of engraving - 2" x 8". Item #46B-10 is the same deskplate in 2" x 10" size. Highly polished Black Marble with white veins. Has a black brass plate engraved to show gold lettering. Sample shown has 1/2" Goudy font in all upper case for the first line with 3/8" upper/lower for the second line. Shown is the 46B-10. You could have a gold or colored brass plate on these items if you wish. Item # 183 - Deskplate and Holder 1 1/4" x 6"
Item # 183A - Deskplate and Holder 1" x 6"
Item # 230 - Deskplate and Holder 2" x 8"
Item # 232 - Deskplate and Holder 2" x 10"
Item # 270 - Deskplate and Holder 3" x 8"
This is our most popular product. Pick your color plastic insert and decide on whether you want a chrome (silver) or brass (gold) colored metal deskplate. We'll do the rest. Don't forget to check the options tab also. Have a holder already? Replacement plates are easily available! #220 has nicely beveled edges all around! #776 with walnut base - 2"x 8"
Choose #776a for 2" x 10"
#450 - 2"x8" / #451 - 2"x10"
This has an engraved or reverse-engraved piece on both sides. 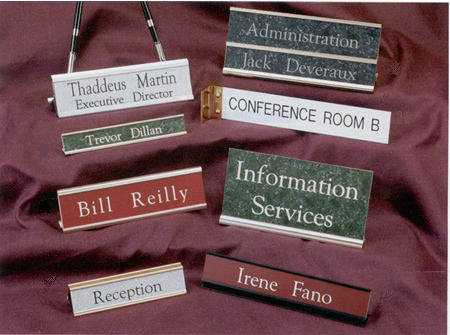 #260 - 2" x 8" / #261 - 2" x 10"
Looking for a 'deskplate' for your office door or cubicle wall? Check our door/wall sign page.